There are days when all I really want is to get home, close the door, find my comfortable clothes, and relax with a glass or two of my favorite wine. It isn't expensive or imported, but it has the subtleties I prefer. Just the feel of the glass in my hand is enough to help me begin to unwind from a bad commute or a stressful day at work. If you keep a small reserve of wine, or have a larger collection but prefer to keep a few bottles ready for entertaining or personal enjoyment, this eight-bottle cellar may be just what you need. It is small enough to fit behind a bar area or on a countertop. Find a nicely priced choice, stock up, and offer your own "house" wine to guests. The interior light lets you check your stock or shows it off to others, if you like to brag a bit. I can fill the cabinet with a selection for the week, set the temperature, and know that I will have a bottle or two ready if a friend should drop by or I'd like to pair a particular variety with a mid-week meal. And when there is a weekend get-together, that is one less thing I have to think about. 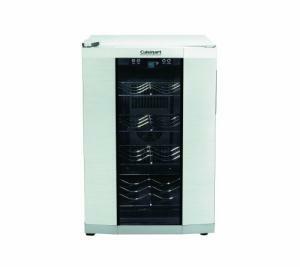 Here's a digital 6-bottle wine cooler made by Haier.